People are divided into two categories: those who are simply addicted to social media and those who are addicted because of work. Well, even those who don’t consider themselves content-eaters cannot deny that scrolling down the webpage usually ends with no results. Fingers automatically tap likes, hearts, or angry faces. Somewhere an informative piece of the article or an incredibly beautiful video might be missed (oh, no!). Even the thought of skipping a food-gym story about the colleague sitting next to you can make your head spin. Who are these gods who control what we see in our timeline? Who is the SMM manager? The question is obvious, but if you can’t answer it, you won’t be able to work effectively. The SMM manager’s profession is one of the most sought-after and promising in the IT industry. This profession requires constant, dynamic learning to keep abreast of the latest trends and knowledge in this field. Thus, the Social Media Manager is a universal specialist who’s responsible for professional management of people and processes within the social platform of the brand. If only you had superpowers and could read all the books and articles about social media marketing in one move, you could probably find the secret qualities of a successful SMM manager. Page after page, you would find pieces of advice, words of wisdom, quotes, and stories about unbelievable success. If only you had time to draw the anatomy of an ideal specialist — but you couldn’t because the list of characteristics is vague. The truth is, Social Media Marketing is not a state of mind and not magic. You cannot become an SMM specialist by having 5,000 friends on Facebook or speaking at a couple of conferences. You can become a professional only by mastering certain tools and constantly pumping certain skills. Actually, to call out the “top 3 qualities every social media manager should have” would be indulging in a stereotype, but it would be fair to draw down the most frequently used words. Undoubtedly, you are free to fill your Kindle eBook with different books all the time. It will be good for you to understand the nature of conflicting views, but there are still many common factors. Slightly more than half of the authors dealing with marketing and social media management themselves consider literacy as an important quality of the SMM manager. 51% of them believe that social media managers need the skill of quickly searching for information, and with that, another essential skill, making analytics. A third of the book authors noted, as everybody seems to know, the necessity of working with graphics packages. And one in five spoke in favor of the usefulness of basic SEO knowledge. As for the SMM manager’s professional training, according to the majority of books, 50% of the experience is usually obtained independently through trial and error. Nevertheless, some lucky ones get a chance to learn from the experience of others. You, reader, are getting this chance today. Stacy, our PromoRepublic SMM specialist, holding a laptop in one hand and a mobile phone in the other, is sitting on a dark black bag made of artificial leather and typing, typing, typing…”Wait a minute. Need to take a look at metrics. Just one more crazy day. Lot of work as usual”. Stacy without phone and a laptop is the Louvre museum without the Mona Lisa, only worse. They are her two main instruments which help her do her work. But now, having a great number of tasks at the beginning of a new quarter, Stacy is ready to share her mind regarding the meaning of social media management. Planning is hard and time-consuming, particularly when taken out of a comprehensive market analysis with a clear list of goals and objectives. It also, on the other hand, helps to avoid last-minute rushing to choose what content to publish. Some of the famous brands, all known even at the far corners of the world, aren’t afraid of certain kinds of experiments. For instance, remember one Sunday night of the year 2003? That was the night of the Super Bowl when the lights went out for 34 minutes. And the great minds of a sandwich cookie’s social media team tweeted an ad that read, “Power out? No problem. 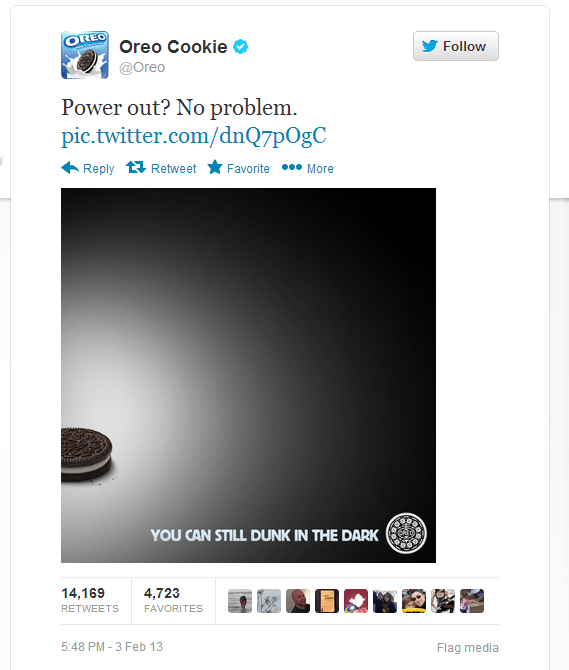 You can still dunk in the dark.” That message got almost 15,000 retweets! It wasn’t as easy as it might seem. The social media team did a plan ahead, a plan which included two different versions of the victory tweet (one for the San Francisco team and one with the colors of the Baltimore Ravens). More than that, though, they kept an eye on every moment of the event, and as it turned out, they didn’t miss the glory moment. So, plan ahead, but be ready to make the leap if an opportunity presents itself. “It depends. If we talk about creating a social media strategy for well-established businesses, it’s always good to mix proven mechanics with something new. But if circumstances allow me to take a risk — I go for it. It’s always interesting and challenging, and I love challenges,” comments Stacy. Still, finding the balance in social media content is necessary if the brand wants to post something more than too-sales-y content. Like any science, social media marketing has a number of rules. One of them is the 70/20/10 rule –70% value, 20% promotion, and 10%, human. So, 70% of what the brand is going to post should be of value to its audience. If the audience can take something from your content, then it’s valuable. When it comes to 20% promotion, think of Black Fridays, holidays sales, or any other special offer that you’d be very likely to make. The other 10% allows you to be who you are. Posts of this kind evoke emotions and provide inspiration. Stacy took a breath and looked at the monitor of her laptop. Without averting her eyes, she uttered, “I-N-S-P-I-R-A-T-I-O-N.” When something caught her eye, she took a pencil and made a sketch. Then she was deep in thought. Yes, the social media manager, as a creator, should take time for a favorite thinking food, at least for a moment. Avinash Kaushik suggests four major social media metrics that are likely to work well on every channel. They all were explained in a 2011 blog-post. Regardless of its date, they are still up to date. Conversation rate – The number of conversations per post. On Facebook, Google+, and LinkedIn, it’s comments. On Twitter, it’s replies. Amplification rate – The number of reshares or retweets per post. Applause rate – Retweets, Likes, +1s, etc. Economic value – The sum of short-term revenue, long-term revenue, and cost savings. “Sometimes I wake up at night, remembering several posts from my previous work that I forgot to upload and post. Thanks to PromoRepublic, I never do this now.”, shares Stacy slightly smiling. She takes her laptop — “Time to create something great for our followers!” — she smiles and starts typing again. Social media management is a way of monitoring and participating in social conversation across platforms. The only way to effectively manage social media to improve efficiency.